The fireworks display lights up the night sky above the Hotel Colorado during last year's Festival of Light in Glenwood Springs. 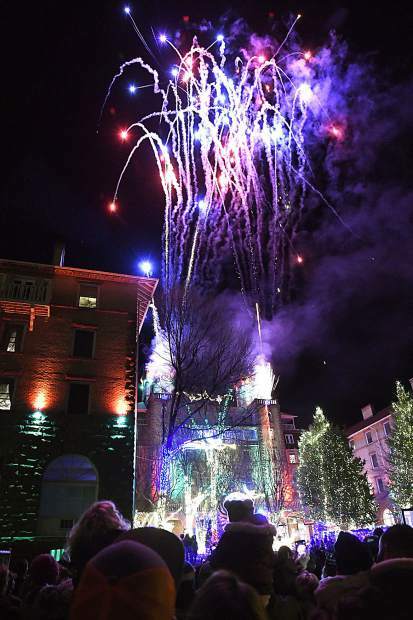 Every year for the past 29 years, the Hotel Colorado and Glenwood Springs mark the beginning of the holiday season with the annual lighting of the historic landmark at Sixth and Pine. New this year, the stage for all of the outdoor performances during the event will be in a different location. “To improve the viewing experience for the public and the community, we chose to put the stage out on Sixth Street,” Hotel Colorado General Manager Christian Henny explained. In years past, performances have been held in the courtyard in front of the hotel, leaving the crowd gathered on Sixth Street unable to see the entertainers. Henny said this will alleviate the crowding in the courtyard and with the transition for the fireworks show, which will be smoother and less of a wait than previous years. “This year’s setup will make a better flow for everyone to see the entertainment on Sixth Street,” Gilley said. Festivities will get started with Tuba Christmas in the hotel lobby at 1:30 p.m. The band is made up of all local volunteers who play the tuba and euphonium. New to the Festival of Lights this year, Tuba Christmas is part of a worldwide movement that celebrates those who play, teach and compose music for instruments in the tuba family. Local David Fulton will portray hotel founder Walter Devereux for another new event, called the Fireside History Story with Walter Devereux at 3 p.m. in the lobby. Another annual event continues this year when Santa arrives to visit with children in the Devereux Room starting at 3:15 p.m.
At 6 p.m., Henny, along with members of Melville family (new owners of the hotel) and Glenwood Springs Mayor Michael Gamba will welcome visitors at the stage on Sixth Street. After Christmas songs from local school children and performances by the Rocky Mountain Scots and the Denver Dolls, Santa Claus will lead the countdown to turn on the lights. “We’re very excited that Marion Melville, the matriarch of the family who owns the Hotel Colorado, will be up on the stage with Santa to flip the switch and turn on the lights,” Henny said. Once the hotel is lit, the annual fireworks show will follow, setting the sky above the 125-year-old landmark ablaze.